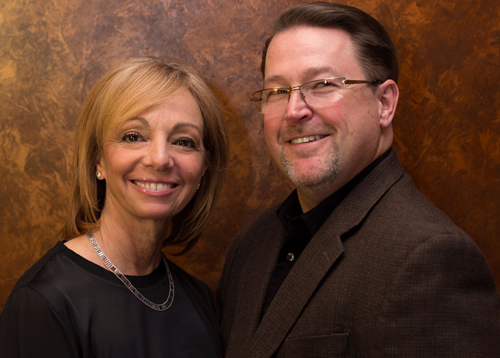 Chameleon was founded in 1999 by Carleen Buden and Stan Bialecki. Their vision was to create the finest salon experience for their clients and long term, rewarding careers for their stylists. Carleen Buden is a co-owner of Chameleon Haircolor Cafe & Spa, based in North Haven CT.
She has been a talented artistic stylist for over 30 years. She has trained at the national academies of Vidal Sassoon, Bumble and bumble, Oribe, Goldwell and glo Minerals. Carleen believes that education is critical to the success of Chameleon and our team. She continually brings in national educators into Chameleon and sends our team to NYC for advanced education. Carleen has partnered Chameleon with Bumble and bumble, Oribe and Goldwell. Our strong relationship with these beauty industry leaders provide our clients with the finest hair care products and our staff with the industry’s best education. Stan Bialecki is a co-owner of Chameleon Haircolor Cafe & Spa, based in North Haven CT. He founded Chameleon on the belief of providing the ultimate level of client satisfaction. He introduced our “100% Love Your hair Guarantee” to ensure all clients leave Chameleon looking and feeling their best. He believes in providing long term career paths for the Chameleon Team Members. He has implemented the the best business practices, provides progressive staff development, and the latest artistic education to the Chameleon Team. This allows Chameleon to deliver the finest client experience. He has guided Chameleon to be honored as a Top 200 Salon, in the United States, by the prestigious Salon Today Magazine.